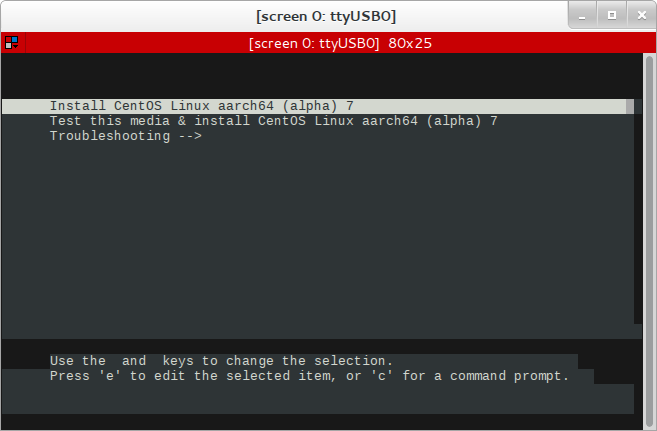 The journey for rebuilding the latest release of CentOS Linux 7 on AArch64 hardware has certainly been an interesting one. After a few bug reports, a couple minor patches, and several iterations through the build system, we finally have a release for community testing and consumption, which we'll have available for install early next week. 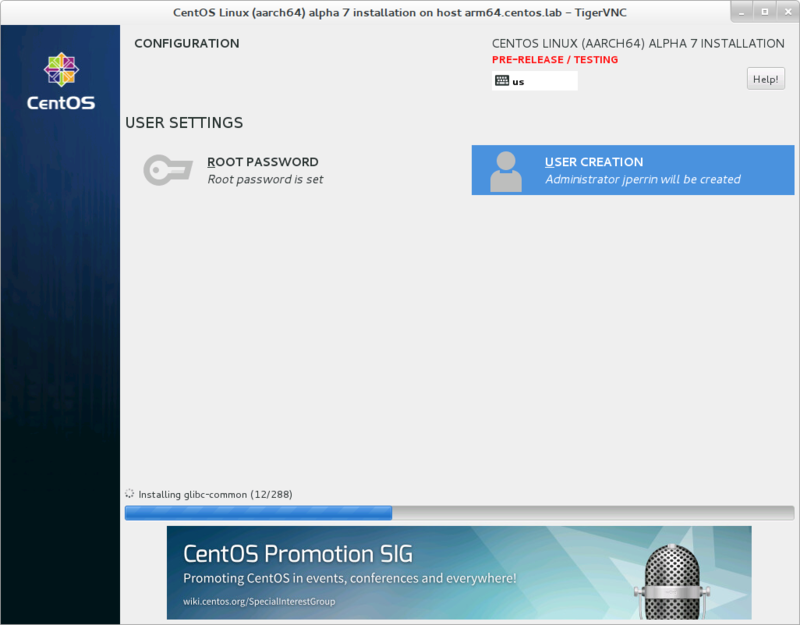 There are some differences with a traditional CentOS install that users wishing to experiment should keep in mind. 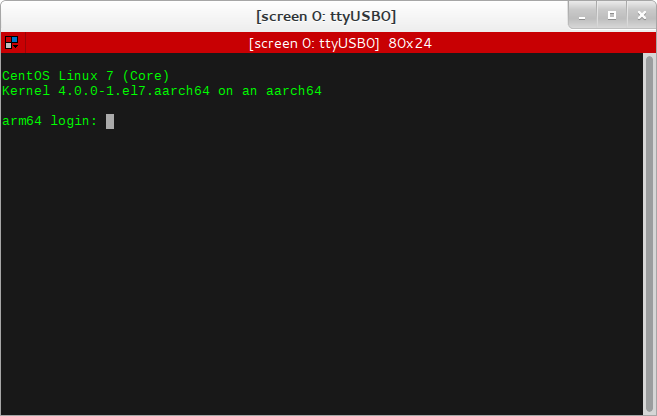 Because AArch64 hardware is still very new, this build requires a newer kernel that we'll be patching fairly regularly with help from the community as well as various vendors. The initial alpha release will ship with a kernel-4.0.0 based kernel, however we're working on providing a 4.1 based kernel using ACPI very soon. After the initial kickoff next week, we'll start setting expectations for fixes, release cycles (I'm thinking monthly, in keeping with other plans) and more. If you want to participate or contribute patches, please join our arm-dev list and say hi. In the example below, I copied the boot.iso to USB via dd. For the hardware I have, the installer's started over a serial interface, and then accessed via VNC. A text mode is available as well, just like the default CentOS 7 installer for x86_64 (you'll probably want to use VNC initially). 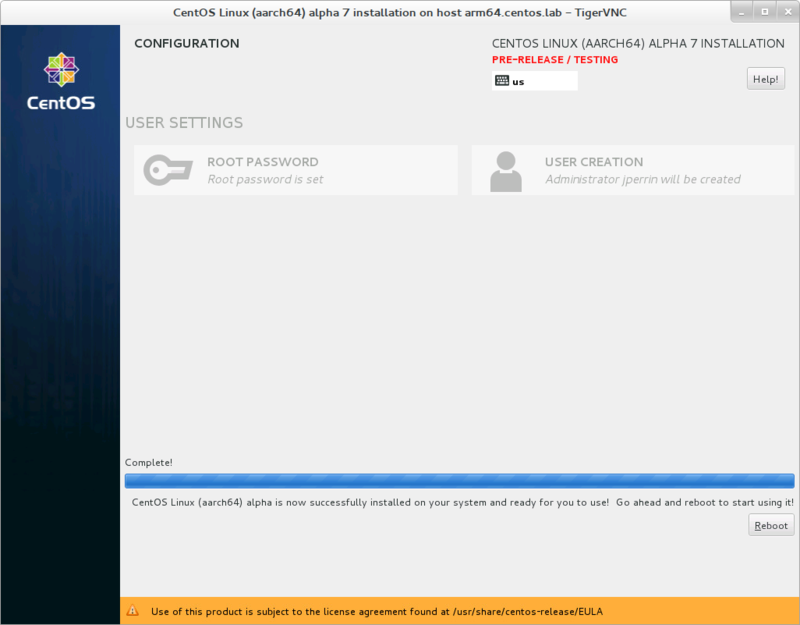 The VNC based installer is identical to the one you're already familiar with for CentOS. The only difference of note here, is that by default only the 'minimal' install is available. Additional packages may be installed after the installation completes. This is something we'll improve on as the AArch64 build matures. Just as you'd expect, once the installer completes successfully, you'll be prompted to reboot. After the installation completes and you have rebooted the system, the console login prompt shows the 4.0.0-1 kernel goodness, and you're ready to deploy additional software and configure the system. I use terminator for my terminal emulator, but for the serial connection, I'm just using screen. screen /dev/ttyUSB0 115200 with a null modem usb->serial cable. thanks you! I did not know what screen can serial-connection ! I tried to copy boot.iso with dd on a SDCard but that doesn't work on a Banana Pi M64. It use u-boot and not an UEFI. Will CentOS do something for u-boot aarch 64 owner ?